It’s hard starting a new biotech business, especially if biotech entrepreneurs find themselves bootstrapping a new business in isolation. Yet distributed across our region is a healthy ecosystem of thriving biotech businesses. 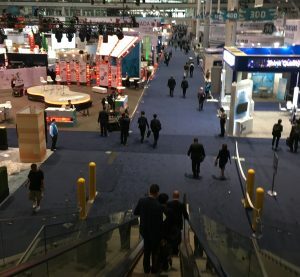 Between these regional businesses and some well-respected research institutions, it’s clear that the northeast has the potential to support an active and productive community of biotech entrepreneurs. So when the NIH invited Jake Reder, co-founder and CEO of Celdara Medical in Lebanon, NH, and Mercedes Rincon, Professor of Medicine at the University of Vermont, to apply for a new grant supporting the creation of regional biomedical accelerator hubs, they jumped at the chance to pull together a dream team of experts on medical entrepreneurship in the northeast. Jake named the new hub project “DRIVEN”, the acronym borrowing letters from the abbreviations for each of the five states that the hub will serve: Delaware, Rhode Island, Vermont, Maine, and New Hampshire. The hub already includes key organizations from these states, namely Celdara Medical, Simbex, Dartmouth, the University of New Hampshire, the University of Vermont, the University of Delaware, Mount Desert Island Biological Laboratory, Maine Medical Center, Brown, and the University of Rhode Island. The first three years of DRIVEN hub development are covered by the new grant, ultimately launching the hub into self-sustainability. The grant-funded phase of DRIVEN starts this year with a focus on identifying and curating the existing biotech resources in the northeast region. “We don’t want to recreate resources already out there and that are already great!” says Julie Coleman, the project manager hired specifically to oversee DRIVEN. Each DRIVEN institution has identified a pair of entrepreneurship leaders. Their first task is to identify existing resources, at their institutions, and in their states. Once resources have been identified, the DRIVEN team will collect and curate them on an educational website targeted to anyone with ambitions for biomedical entrepreneurship. The team plans to spend the first year talking directly with the community of researchers and biotech entrepreneurs already working around the northeast. They will learn what technological resources they rely on, what resources are missing, and how to help them connect with each other. “We want to engage as many people as we can,” Julie says. Years two and three of the grant will cover the creation of new tools based on the research of the first year. Those deliverables haven’t been determined yet, but Jake expects they will involve curating existing resources so new entrepreneurs can educate themselves, such as recording webinars and connecting people with internships. And perhaps most importantly, DRIVEN will need a business model to keep the hub self-sustaining after the three-year grant period. Want to learn more or help the DRIVEN hub? Julie will be holding a webinar on November 12th called “Introducing the DRIVEN Accelerator Hub.” For more information and to register please visit: http://med.uvm.edu/itrep/webinars. You can get in touch with the DRIVEN team at info@drivenacceleratorhub.com. My background is in Cellular Biology and Fluorescence Imaging and my current position as Applications Scientist for Chroma Technology mostly involves training users with advanced microscopy equipment to use our optics for biomedical research and fluorescence, as well as diagnostic applications. When the VBSA Board of Directors first started talking about the BIO International Convention, I did a little research and thought that the Convention looked interesting, but mostly it looked “marketing and sales”–oriented. However, I figured any meeting or conference with this many people attending had to have something to offer, right? I thought that I would wear my “Vermont Biosciences Hat” for the meeting and see. 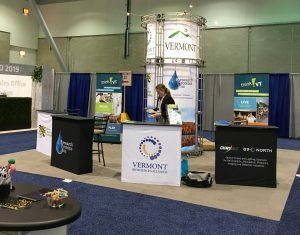 A small corner of the BIO International Convention floor. I must say that I was very pleasantly surprised! Having all these countries, states, and businesses represented was not only a treat for the eyes but much more interesting (at a variety of levels) than I could have imagined. There were actually several companies there that we, at Chroma, do business with around the world. And there were several people who knew researchers whom I have worked with over the years, especially from Core Facilities (mostly at Universities) that do fluorescence and imaging research. I ended up with several business cards and emails from folks interested in future work, and I have heard from several already about different projects that they think I might be able to help with. All-in-all the BIO International Convention was a great meeting/conference for me and Chroma. Now I must say that I don’t think I convinced anyone to move their company to Vermont, but I might have the names of several people that could be interested in working here in the future. More than worth the time and money, and I truly hope that we can arrange to go again next year.